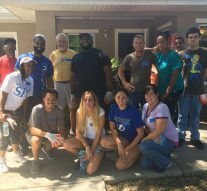 On Friday, April 21 SPC Downtown and Midtown campus joined together to volunteer with Habitat for Humanity to help revitalize a home for a deserving family. There was a total of 10 SPC students and staff out of the 16 total volunteers that showed up and were put to work. Habitat homebuyers help build their own homes alongside volunteers and pay an affordable mortgage. The team was tasked with restoring the home by painting inside the house, changing doors in each room, yardwork in the front and backyard, pressure washing the driveway, cleaning the outside of the home, and also changing out windows. Habitat for Humanity actively helps the community by providing affordable housing for families and SPC was proud to join Habitat, the local community, and the new homeowners in helping to make this a wonderful home. Photographs from the event can be found on the SPC Downtown Facebook page.